Friday was fairly uneventful. I did my morning weigh-in and was up 2 pounds. The WW meeting was nice, the discussion topic was anchoring. This blog has become my biggest anchor. I couldn't quit now, I have a blog to keep up! I wasn't sure if I should go to the gym given that I had a 10k to run the next day but in the end I decided to just go for it. I did a 25 minute run at what felt like an easy-ish pace. Then I did chest/triceps/core for weight training. When I got home Marek was in a VERY bad mood. He'd missed his nap (too excited having grandma over to visit) and he was screaming/crying at the drop of a hat. Not his usual self. So to distract him and give Miguel and my mother some peace I took him to Costco. The two of us had hot dogs for dinner and shared a very-berry sundae (ff frozen yogurt with strawberry topping) for desert. I figured I'd just call it carb loading. Bad carb loading though. After getting Marek to bed, which felt like an Olympic challenge, I packed up for the race. I had some nervousness about how things would go given that I just did the 67 mile bike ride last week and that I haven't trained much at all. In fact, I haven't done a run more than three miles long since the half-marathon in February. And all the hills, the 10k route notes total elevation climbing is about 1200'. A type, right? I don't really know what that means for comparison but it just sounds intimidating. Anyway, I knew I wasn't going to back out (something I'd actually considered earlier in the week) so I got my stuff together and finally got to bed around 10:30pm, after tossing and turning I think I went to sleep around 11pm. Up at 5:30am preparing to hit the road! I still have my period so I had to take extra stuff, put it in my spibelt along with 6 shot bloks and my ID. I need one of those RoadID bracelets. Anyway, I meant to take some ibuprofen but I forgot. I had my regular coffee Special K cereal for breakfast and we got on the road. A couple of my mom friends joined us, (Hi Laurie and Karen!!). Miguel and his friend Marvin were doing the 1/2 marathon so they took a separate car. This was Marvin's first race ever and Miguel's first 1/2. We got to the park and had a bunch of time to kill before the race started. That's Karen to my right and Laurie next to her. 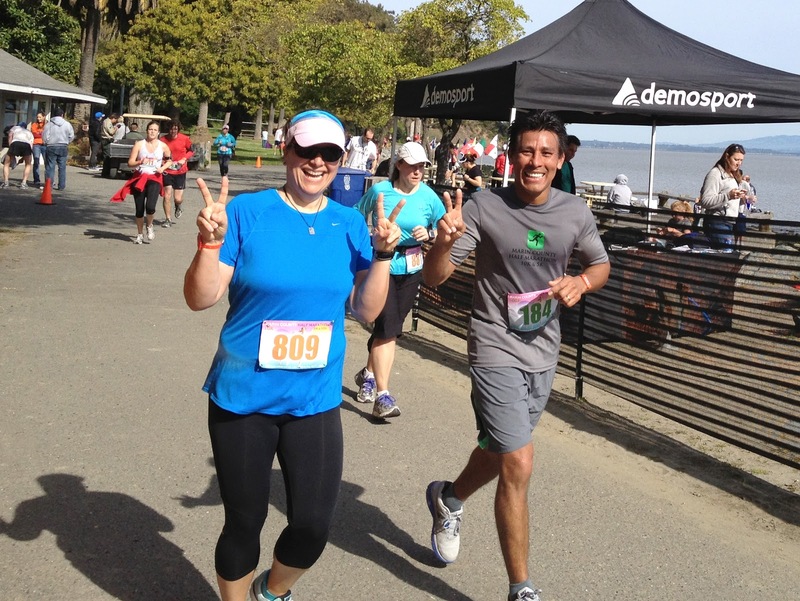 This was Karen's first race event so it was particularly exciting! The half started at 8am - I wished Miguel good luck and sent him on his way. I ate an AccelGel around 8:20am. The 10k started at 8:45am and I was still feeling really unsure how my body would respond. I started running and hoped for the best. Once I was warmed up I felt pretty good. I was shocked to find that I was able to run up that first big hill, which turned out to be the worst one of the day. I just did what I do on the bike, I picked a spot not too far ahead and ran to that. Then I picked another spot and ran to it. Next thing you know I was halfway up. Once I was halfway I felt I had a chance to make it, which pushed me on to 2/3 of the way. Once I was 2/3 of the way I just put my head down and pushed through the discomfort. My body did me proud! And the scenery on this run was just beautiful. Most of the time I could see the bay, and the weather - couldn't have been more perfect. From there it was rollers, followed by a slight decline. During the decline I saw Laurie coming up the other way and she told me to "save your energy!" I was scared of turning around because I knew, what goes down, must go up. But you know what? The return wasn't that bad. Whenever I came to an uphill I just started throwing my elbows back and concentrating on using my quads. Push, push, push - I'd tell myself. And it worked! As I got closer to the park, and realized the hills were all behind me, I knew I'd make it without having to walk. I didn't walk one time! Not even when drinking water. Love that man. Can't wait to see the official pics. We got home around noon and after some shenanigans around the house finally got the kids out to lunch. I probably shouldn't tell you what I ate, but you know I will. I had an order of onion rings (yes, all to myself) and a bowl of new england clam chowder. I followed that up with eating 1/2 of one of the kids giant pancakes with butter and syrup. It was all very satisfying. And I tracked it all. I got 14 APs for the run and used a ton of weeklies to count all the high fat/calorie food. Oh well, not going to worry about it. I had a relatively healthy dinner, one slice of pepperoni pizza and a big salad. I plan to keep my eating in check tomorrow. Though TTOTM + candy is never a good combo. Well, that's it from me, I'm exhausted. I don't think I'm going to make it to 9pm. How neat that you got to finish with Miguel! And what a great result! Congratulations Michelle! That's a terrific finish time, especially with those inclines! Wow. I hope you enjoy the rest of your weekend!